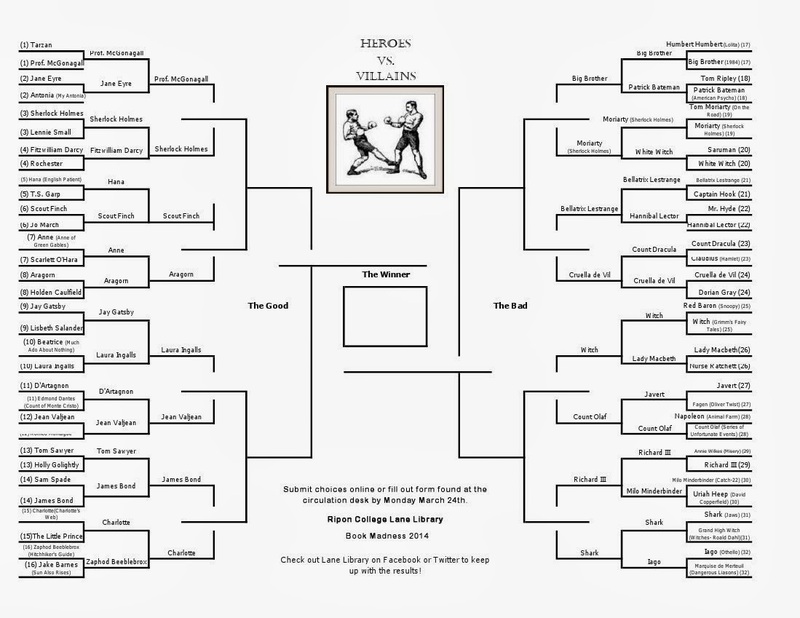 We have now arrived at round three in our March Madness Literary Knockdown, better known in the tournament world as the Sweet Sixteen. Voting is now open until the Monday after Spring Break for the Sweet Sixteen at http://bit.ly/1i87PMJ for your favorite literary heroes and villains. We are now down to only 8 heroes vs. 8 villains, and oh, how the mighty have fallen. Narrowing down from 64 to 16 has not been easy, but you have helped your favorites move on to the next match. Curious as to which hero Charlotte of Charlotte's Web had to beat to get this far? Wondering how Hannibal Lector of Silence of the Lambs got knocked out of contention? If you want to see the entire bracket, how we got to this point, and which Heroes and Villains are left, find those glasses again for the updated brackets below. Voting on our Sweet Sixteen Heroes and Villains will continue through Monday, March 24th, and our next winners will be announced on Tuesday, March 25th; stay tuned to our Facebook and Twitter pages for updates. Enjoy and vote to make sure your favorites make it to the next round!